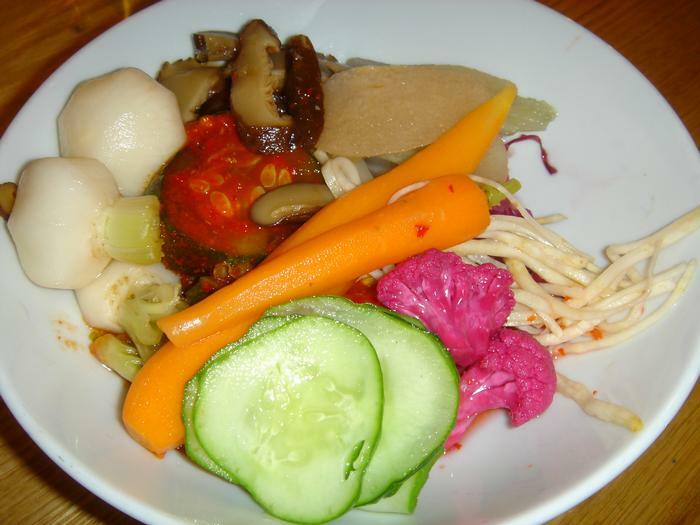 This entry was posted on November 14, 2007 at 11:09 pm and is filed under Destinations, Restaurants, Reviews with tags Asian Fusion, Japanese, Korean, New York, Ramen. You can follow any responses to this entry through the RSS 2.0 feed. You can leave a response, or trackback from your own site. I love Momofuku! The Momofuku special is my favorite bowl of noodles. Didn’t try the pork buns, but definitely will next time we’re in New York. I too LOVE the Momofukus. The Noodle Bar just moved “75 feet” (according to their sign) up the block, and it’s a fantastic improvement. Although I never had any complaints, I’ve heard and read similar reviews about the noodles being a bit soft in the past. Well, this was an occasional problem at the older location, supposedly now fixed at the new one (who knows, maybe it’s the bigger kitchen?). Just an FYI, pretty sure the 2 different porks in your Momofuku Ramen were belly and shredded shoulder, not belly and shredded pork neck. 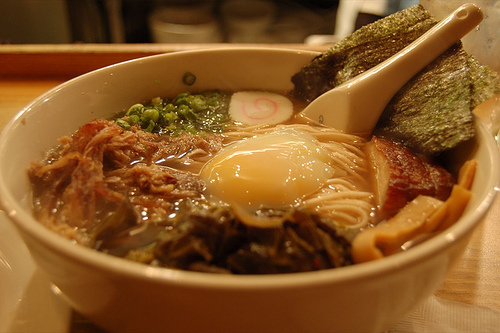 They do have a pork neck ramen though (never had it). 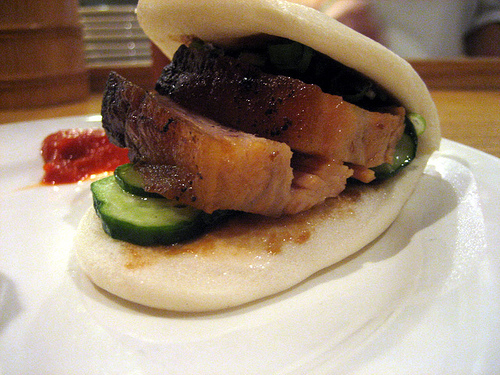 So many great choices on the menu…Pork buns are a true MUST!! Rice cakes and pickles are great. 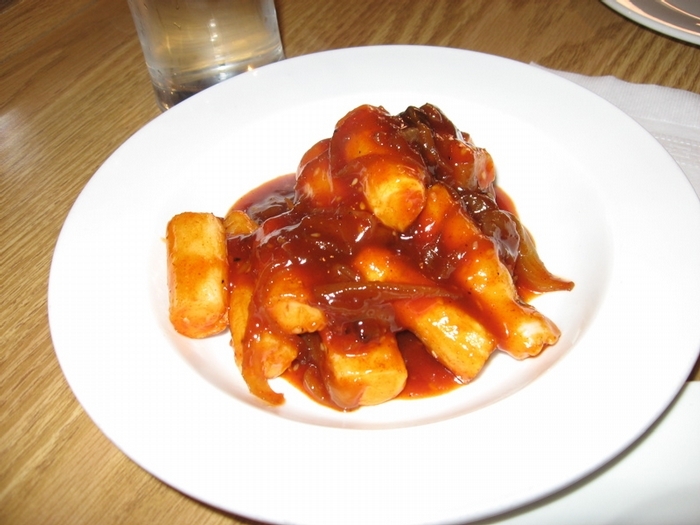 Consider adding the baby octopus (crispy and tossed in some sort of garlic vinegar sauce) and the kimchi stew (over rice, not noodles, and a must share, unless you’re a big eater) to your list on the next trip. And, of course, their new homemade soft serve ice cream!!! Anton, you are right about the shoulder – and the fact that the noodle bar moved 75 feet away. I guess they haven’t fixed that soft noodle problem, since I went to the new location. I wanted the kimchi stew so badly, but our waitress did tell us it was huge and I didn’t have the room for it … but that would also be on the list to order next time! Thanks for the link to my review! I have to echo the praise for the pork buns. The day I went, I was really unimpressed w/ the broth. Also, I heard that there’s some amazing pork leg or something…I can’t remember. Great review, great foodporn!